Easy access by car, lots of MBTA trains to and from Boston, and frequent buses to Boston and other major cities. Worcester MA, 48 miles (77 km) due west of Boston, 51 miles (82 km) east of Springfield MA, 63 miles (101 km) northeast of Hartford CT (map), is well served by Interstate highways, bus and train routes. The Massachusetts Turnpike (Mass. Pike, I-90) passes just to the south, connecting with I-190 and I-290 which meet in Worcester. I-84 comes north from Hartford to the Mass. Pike a short distance to the west. Peter Pan Bus Lines (Tel 800-343-9999) operates nearly a dozen buses daily between Boston and Worcester, five buses daily to/from Springfield MA, nine buses daily to/from Hartford CT, and 10 buses daily to/from New York City. Buses operate from the Peter Pan Terminal at Union Station, 2 Washington Square, Worcester MA (map). 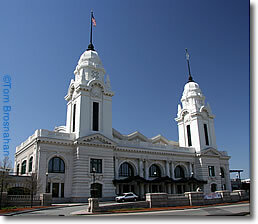 Worcester's stately Union Station, right off I-190 (map), is served by 16 MBTA Commuter Rail trains daily to Boston, and the same number from Boston, on the Fitchburg/Worcester line with more frequent service (20 trains daily) to come. Trains are timed partly for commuters, more frequent eastbound ("Inbound") early in the morning to Boston, and more frequent westbound ("Outbound") to Worcester in the evening, with fewer—but sufficient—mid-day trains. Check the schedules here. Amtrak 's Lake Shore Limited comes through Worcester daily from and to Boston on its route via Springfield MA, Pittsfield MA, Albany NY, Buffalo NY and Cleveland OH, but it does not sell tickets to passengers traveling just between Boston and Worcester. The closest stations to Worcester for Amtrak trains are Springfield MA and Boston MA. Worcester Regional Airport serves some charter flights and general aviation. Bradley International Airport south of Springfield MA and north of Hartford CT has more flights, and Boston-Logan International Airport has the most. The best way to get to Worcester by air would be to fly to Boston, then take a bus, train or rental car to Worcester.